Geraldine Norris (nee Green) emailed us from Australia in connection with the artist Will Maile and her parents, Bert and Clarice. Are you in the presentation photo ? This brings back a few memories. I think the Rev. is Alex Banks who conducted the wedding of my wife (Heather Stevens) and I in 1969. Geraldine Norris (Nee Green – 2nd lady from left) married Martin Norris (Policeman) who crewed for me a couple of times at Benfleet YC. 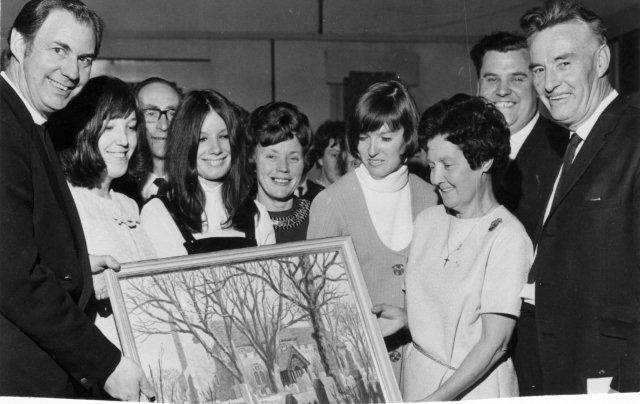 Jackie Newman (Nee Green – 2nd lady from right – seem to remember she was an ex. Television Topper or Tiller Girl dancer?) married Barry Newman who acted as our solicitor when we moved from Essex to Surrey. We were all members of the yacht club.